It started when one teacher saw a TV ad about saving the bees – and grew into a national program, Bee City Schools, integrating outdoor education and technology into school-wide projects focused on saving pollinators. We would like to introduce educators to the Bee City Canada/Bee City School Program, an important initiative that is quickly making its way through elementary and secondary schools across the country. The original objective of the Bee City School Program was to encourage an inquiry about the bee crisis and the role that pollinators play in our food cycle. Currently, Bee City Schools are expanding this inquiry by integrating outdoor education and technology into school-wide projects while encouraging parents and communities to join students in their learning. In 2017, the Bee City School Program became a recognized certification from Bee City Canada. The origins of this initiative are modest and began in 2015 as we, two teachers in Scarborough, Ontario, were working on a partnering plan for an upcoming Science unit. It started when Ashleigh White, a Grade 4 French Immersion teacher, saw a CheeriosTM commercial that encouraged consumers to “bring back the bees” and decided to use the ad as an introduction to character education in her classroom. Thinking that this might also be an opportunity to begin working with a colleague on a Science Buddies project, Ashleigh approached Grade 8 teacher Doug Whiteside. Together, we felt a call to action and were immediately motivated to open an inquiry project that began by asking, “What is happening with the bees?” A true inquiry often requires teachers and students to connect with resources and people outside of the school. Ashleigh began to reach out to organizations in Toronto, and with a little research, she found Bee City Canada, a charitable organization that was in the final stages of becoming officially recognized by Toronto City Council. She thought she might be overreaching, but Ashleigh took a chance and made a call to Bee City Canada. Director Shelly Candel responded within one day and graciously offered to visit the school and help answer some of the students’ questions. This was the first workshop that Bee City presented to students, and the response from both classes was beyond expectations. The seed had been planted and so came the idea to offer more workshops based on new questions stemming from the Bee City Canada classroom visit. The roots of the Bee City School Program sprouted that day. Our aim with the Bee City Canada Schools initiative is to cultivate a climate that encourages students to ask questions and to be critical thinkers and problem solvers by examining real-world contexts. We strongly believe that our growing network of Bee City Schools has come to realize that through inquiry, experiential learning and “getting our hands dirty,” we can begin to make positive change in our communities. Our program is unique in that it can implement a broad range of current teaching practices into one school-wide initiative that welcomes all learning entry points. We also generate support from parent councils, local government officials, and businesses who are inspired by the team building that is now so evident throughout the hallways of our member schools and in the vibrant pollinator gardens that were established and are now diligently maintained by students ranging from Kindergarten to Grade 8. Our network has come to realize the severity and the implications of the declining bee population in Canada and around the world. We also know, however, that it’s not too late to do something about this problem. By taking action and planting bee-friendly flowers, as well as educating our communities on the dangers of pesticide contamination, we believe that we are helping to create a new culture of students as global citizens of character. We hope they will become the future leaders of collaborative inquiry devoted to reversing the decline of pollinators in Canada. Bee City Canada, a federally recognized charitable organization, welcomed Toronto as the first Bee City in 2016. In the Spring of 2016, Tredway Woodsworth Public School in Toronto was declared Canada’s First Bee City School. We revamped our STEM program with a project that would offer students a lens into real-world, large-scale problems. This endeavour commanded collaboration among students and teachers in order to achieve our learning objectives. This testimonial was one that came about through the exploratory stage of the problem-solving model that is typically used in math, but can and should be applied to early stages of inquiry work in science as well. Through brainstorming and communication, students were able to better understand the problem even if possible solutions were not yet conceptualized. 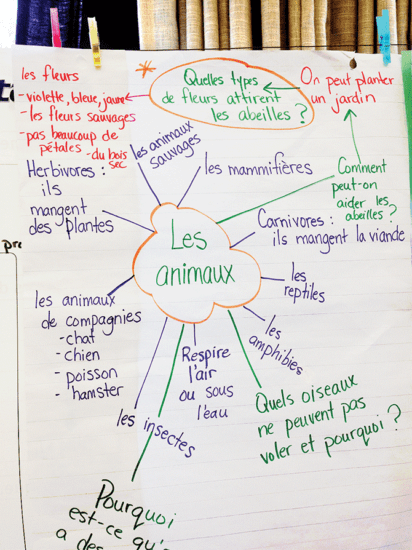 Ashleigh White’s Grade 4 French Immersion class began with a brainstorm chart highlighting some key inquiry questions into the condition and decline of bees and other pollinators. Students took pride and ownership in preserving and protecting their pollinator garden space. The curiosity spread throughout the school, with questions such as, “What plants attract the bees the most?” and “Do bees communicate with each other?” Discussion and discovery became commonplace as evidence of inspired inquiry work. Doug Whiteside’s Grade 7 science students construct and decorate “bee hotels” that offer a temporary rest or pit stop for pollinating native bees and butterflies. 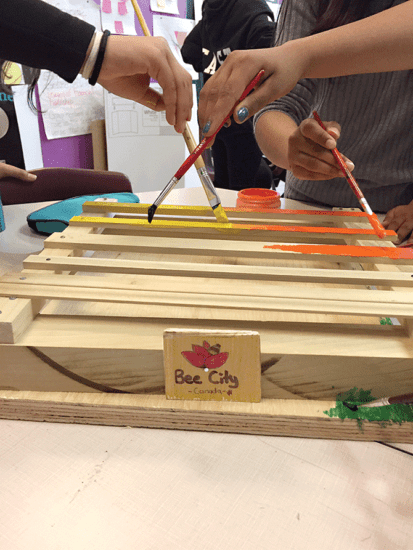 Eventually, Bee City Canada invited us to help them develop an application process whereby schools throughout Canada could work on similar initiatives and inquiry. Realizing that our inquiry project could guide other schools to educate students about pollinators and the bee crisis, Bee City Canada relied on our experience to establish this new program. The Bee City School Program was created when Bee City Canada saw the work that was taking place in our school. This rich learning opportunity could not be contained to one school, and our school became the model for Bee City Schools to emulate. Subsequently, Bee City Canada has invited both of us to sit on the board of directors as representatives for the Bee City School Program. In June of 2018, Doug was given the title of Bee Schools Director and he now acts as the liaison for existing and future Bee Schools. Small classroom projects may grow into school-wide initiatives once the school community becomes more aware of the issues that their inquiry addresses. The thriving pollinator and vegetable garden that was entirely established by students at our school, with support and funding from Bee City Canada, is just one example of the positive work that we are doing to support the community as a whole. Before embarking upon this project, we developed a solid connection with our local city councillor, Glenn De Bearemaeker. He is just one of our great supporters and he was thrilled to join our students at the “2017 Tredway Woodsworth Pollinator Fair.” Mr. De Bearemaeker connected the local community and our school by creating awareness amongst his constituents and engaging in the important conversations necessary to effect change. Following a cycle of inquiry allowed us to let go of some of the rigidity of conventional teaching and, three years later, students have become independent learners, innovative knowledge builders and creative thinkers. By focusing on the authentic problem of the declining bee population, students are continually empowered to explore the potential of their own school community. 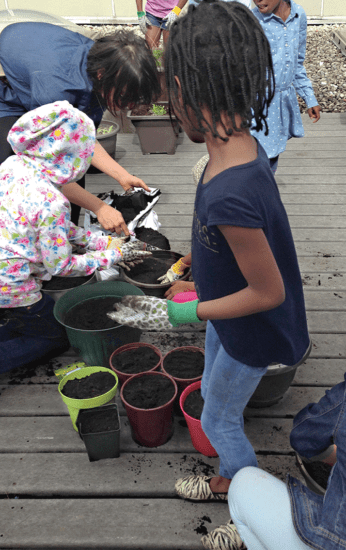 Creating and tending to a pollinator-friendly garden has encouraged students to connect with nature as they learn about native plant species and how pollinators help to sustain natural environments. Researching and building structurally sound and visually stimulating bee hotels offers experiential learning and opportunities for students to solve problems using real-world contexts. As recipients of the EdCan Network’s 2017-2018 Ken Spencer Award for Innovation in Teaching and Learning, we are dedicated to realizing the change that school communities can make by embracing the environment as an authentic outdoor learning space. Ultimately, an initial brainstorming session that was designed to involve students in their Science lesson has grown into a widely successful project that has become an ever-expanding network of shared learning and practice. We have developed a website – www.pollinatorcentral.com – where teachers and communities can blog with us about our experiences and understanding of the world of pollinators. We also launched an e-learning curriculum resource site with the introduction of our first course, called “Pollinator Protector Course,” in partnership with Bee City Canada. On our site, edu.pollinatorcentral.com, we will continue to develop and launch courses about healthy soils and sustainable planting practices. Through this site, our shared practice continues to develop and offer support to fellow educators, students and communities. We are learning together about the role of pollinators, especially native bees, in our environment and the effect that a continuing decline in their population will have on future generations if action is not taken. Our students are answering the call to make a change, and we are eager to provide them with the tools that they need to successfully implement and expand this project for years to come.